Work begins on pump track at Farrell Field in West Milford | JORBA - You Dig? 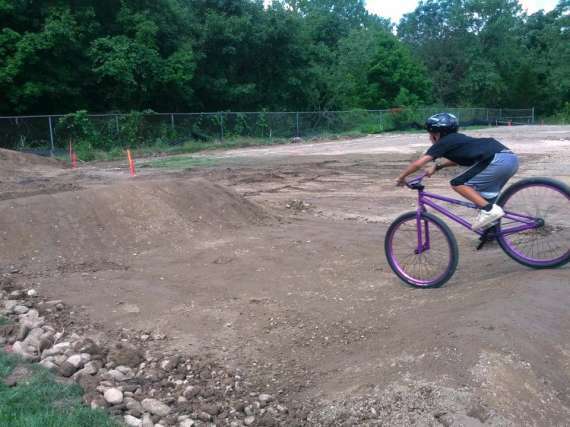 The Jersey Off Road Bicycle Association (JORBA) project to build a Bicycle Pump Track at Farrell Field in Hewitt was taking shape over the Aug. 4 weekend. The site of the new tourist attraction in the Township of West Milford is at the end of Farrell Recreation Field, 30 Lycosky Drive off Marshall Hill Road. West Milford Economic Development Committee (EDC) Chair Robert Nicholson told AIM West Milford that volunteers started working on the track on Saturday. They began with work on the mound, two rollers and a berm, he said. Nicholson said that on Sunday more work followed and a schedule to continue building the track during the following week was being prepared. "This was a big day for JORBA," said Nicholson. "Thanks to the township (officials) for their support. Councilman Michael Ramaglia who is liaison for the EDC, Township Administrator Nancy Gage, Community Services and Recreation Director Jayme Mulhern, and associates with the township engineering department Eric Miller and Henry Den Herder all had a great part. Thanks also to the volunteers that will sweat and toil over the coming weeks to make the Bicycle Pump Track a reality." Jeff Mergler of JORBA said that Den Herder and Miller worked closely with JORBA in site preparation of the track. That work included essentially peeling the turf and replacing it with soil donated from the West Milford Police Athletic League (PAL) and then grading it away from the field for proper drainage. He said it had been difficult to get the machine that is necessary for this particular work. Once that was found, things started to move along, he said. In July, Mulhern reported to the council that 200 feet of drains and back filling were needed. Back in March, Nicholson said Mergler and Dave Van Wert from Team Town Cycle were instrumental in the movement to initiate and bring the bike family sport to the town. Nicholson said that during the previous year former Township Administrator Kevin Boyle and former Recreation Director Keith Knudson – with endorsement of the mayor and council – worked closely with JORBA to get necessary approvals to build the track. Last year the township's engineering division was asked by the township council to provide a field survey layout of the pump track elements in place of the junior soccer field at the recreation complex. The engineering division was directed to provide a site plan for inclusion in the Hudson, Essex, and Passaic Soil Conservation District permit application. Approval of the application was received in a letter from Carl Quazza, chair of the soil conservation district on Feb. 13, 2012. The district that Quazza represents is headquartered in North Caldwell. Conditions in the approval said a copy of the certified plan must be kept on the job site at all times. The applicant or contractor must request a final inspection (once landscaping and final soil stabilization is complete) prior to seeking a temporary or permanent certificate of occupancy, it is stipulated in the approval document. Another requirement is that the district must be provided with written notification of any conveyance of this project. The district must be informed of agents responsible for site construction, and of the job supervisors. The certification is valid for three and one-half years from the date of the letter on Feb. 8. The Preliminary field survey of the site by the engineering division to the council said it was found that a crowned soccer field would not be the best location to accommodate the level base required by the pump track design supplied by the volunteers. Subsequent earthwork calculations indicated that about 150 cubic yards of soil were needed to level the area prior to construction of the pump track, the engineering department reports said. A proposal to use soil donated from the PAL Recreation Center was seen as viable by the engineering division. There was an existing 600 cubic yard pile of soil remaining from construction of the PAL building in 1998. The engineers determined the soil is neither bank run nor topsoil and did not have much use but would be adequate for base material for the bicycle pump track. West Milford Police Athletic Association (PAL) President William Hemstead and others at PAL were immediately on board when they heard the soil stored on their Lake Melody site was needed for the pump track. The pump track elements will require an additional 30 to 40 cubic yards of soil and pump track volunteers indicated there is a specific ideal soil mixture for this purpose that they will select and provide, engineering reports said. The soil from PAL was transported to the site by the township Public Works Department and the engineering department set the grade stakes, as they continued their guidance toward completion of the project. A pump track is a continuous loop of rollers in sloped turns, according to information supplied by JORBA. Pump tracks can be ridden and enjoyed by cyclists of all ages and skill levels. The sport gets its name from a method of propulsion the cyclist uses to navigate around the track without peddling. The pumping motion requires use of both upper and lower body, making it a fitness building activity, according to the JORBA.